I often have people come to me frustrated because they have hit a plateau in their weight loss or they have begun to slowly gain a bit of weight and ask if I can give them a bit of advice. I always ask what their nutrition looks like. The answers range from I eat really healthy, or I eat paleo or I am keto or whole foods or something similar. Which is fine, but quite what I am looking for. So, I after another couple questions I find most often the culprit is hidden calories in their nutrition without them realizing it. I have a friend who takes her lunch and snacks to work every day. She noticed that she had begun to gain a bit of weight and asked for my help. I told her to keep a log of everything she eats for a few days and let me look at it. I know that she regularly exercises and eats primarily healthy foods 85% of the time and had an inkling that she might be inadvertently hiding calories in her nutrition. What I found when I looked at her food log was a couple of things she had changed slowly over time from on occasion to daily, and did not realize how many extra calories she had hidden into her days that was causing a very slow weight gain. Her problem… eating nut butter instead of the nuts. She had found some nut butter packets on sale and began carrying them to add to her snacks at work where she used to carry nuts instead. 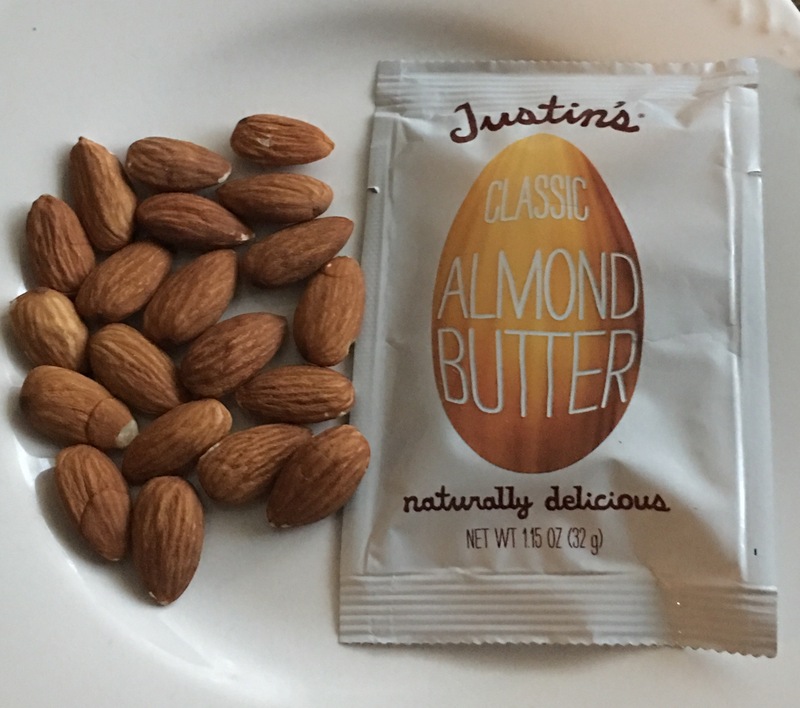 2 Tablespoons of almond butter is NOT equal to 2 Tbs of almonds. Check out the photo above. That is 2 tablespoons of almonds. I put the almonds into a tablespoon and was generous about the portion. The tablespoon was full to the brim and a tiny bit over. About the same size potion wise as the packet of almond butter right? So, what is the difference? Check it out for yourself. Eating 1 packet of nut butter as compared to 2 Tablespoons of nuts is adding 80+ calories to your snack or shake or meal. FYI – carrying a snack portion of nuts is just as easy as grabbing an individual packet of nut butter, and is considerably cheaper as well when you purchase a large bag them. There are plenty of ways we may be sneaking extra calories in our foods without realizing it. Sometimes it is from something small like needing something convenient one or two times and then just continuing the habit and forgetting to be mindful of what the nutritive value of the food is. The email will be going out on Wednesday morning. My email subscribers get all my best tips, tools and strategies on nutrition, mindset and exercise that includes free workouts, recipes, and personal stories and just general random silliness. Make sure you join my tribe for all the latest.